Clearly, not every patient with the rather indeterminate symptoms and signs described above should be submitted to angiography. If peritonitis is present, this will only delay a necessary laparotomy. Moreover, a normal arteriogram does not exclude ischemia as up to one-third of cases are non-occlusive in nature. Conversely, the radiographic finding of an occluded or stenosed superior mesenteric artery does not necessarily imply that this is the cause of the patient's pain. Such lesions are quite common, and are often asymptomatic and of no hemodynamic significance; if discovered on an arteriogram, they may distract attention from the true cause of the problem. Nevertheless, percutaneous arteriography is widely available and can be performed safely in most patients provided that they are not allergic to the contrast medium, are well hydrated, and have adequate renal function. If an embolus is present, the surgeon can embark on a laparotomy with a view to embolectomy and gut revascularization. 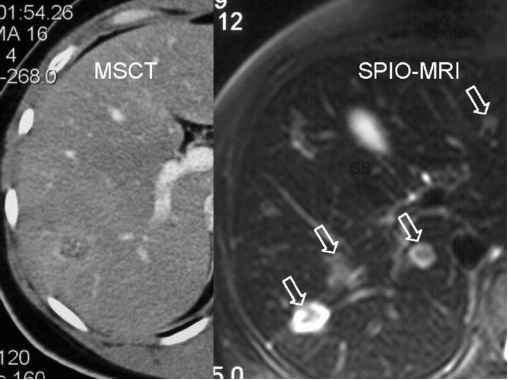 In addition to documenting an embolus, angiography may also identify vasoconstriction, as shown by spasm and narrowing of the branches of the superior mesenteric artery and decreased filling of the intramural vessels. Given these findings, some authors have advocated an 'aggressive' management, using selective injections into the superior mesenteric artery of vasodilators such as papaverine (30-60 mg/h), phenoxybenzamine, or prostaglandin E 1. Although major reductions in mortality from acute intestinal ischemia have been claimed for these regimens, it is difficult to know when exactly to use them and their role in the total context of unexplained abdominal pain remains unclear. Vasospasm is a more complex matter than an angiographic appearance, and its significance is difficult to assess in patients who recover without operative proof of the diagnosis. Clots within the mesenteric system may be dissolved with streptokinase. A catheter is positioned in the superior mesenteric artery immediately proximal to the occlusion and an infusion begun. The arteriogram is repeated after 1 to 3 h and, if no resolution occurs, the concentration of streptokinase is increased. If the patient's abdominal condition deteriorates, a laparotomy is performed. Preliminary reports have been encouraging, but streptokinase therapy causes complications such as anaphylaxis, febrile reactions, and bleeding. Newer agents such as urokinase or recombinant tissue plasminogen activator may prove to have an application.